Doubts remain as to whether the Su-57 is genuinely a fifth-generation fighter aircraft. 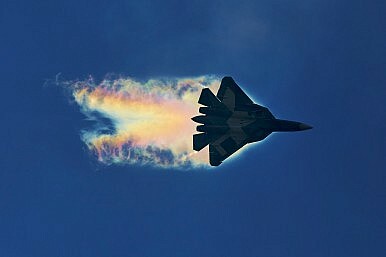 The Su-57 reportedly is a multirole, single seat, twin-engine air superiority/deep air support fighter poised to replace the Russian Aerospace Force’s MiG-29s and Su-27s. “The Su-57 will be armed with beyond visual range air-to-air missiles as well as of air-to-ground missiles including the extended range Kh-35UE tactical cruise missile,” I explained previously. While the Su-57 was slated to conduct its maiden flight this year, a new engine— the next-generation Saturn izdeliye 30 — will reportedly not be ready until 2020.